Now Selling New Homes in Shearwater! The Shearwater Amenities Center opens in July. Meanwhile, get a first-hand look at the beautiful homes in this inspired new community. Taking full advantage of its picturesque setting, Shearwater features attractive homes, scenic beauty including an expansive trail system, plus a variety of amenities for all ages. It just may be the perfect fit. Homes will range in size from approximately 1,637 square feet to over 4,000 square feet, with three to five bedrooms. Both single story and two-story homes will be featured in the community with plenty of options to create the home of your dreams. 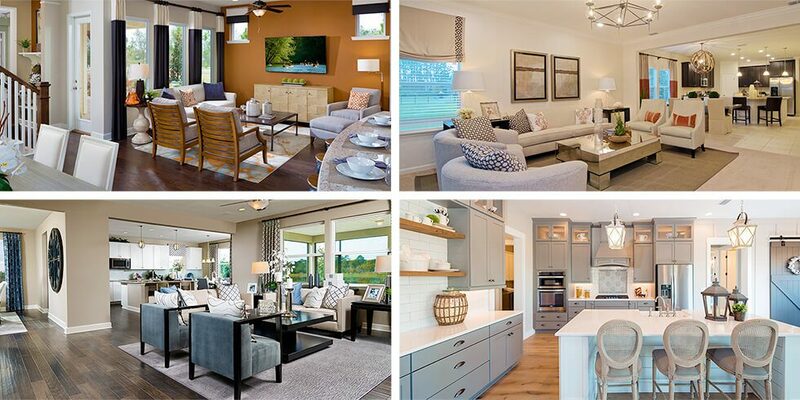 David Weekley Homes, the nation’s largest privately-held builder, will be offering their distinctive collection of Imagination and Designer series homes situated on 40- and 50-foot homesites. You can choose from an impressive selection of homes that are perfectly suited for the Shearwater lifestyle. Homes range in size from approximately 1,637 to 2,862 square feet, have three and four bedrooms and two to three baths. Home prices start in the mid $200,000s. Lennar is offering their signature Everything’s Included® homes on 50-foot homesites. These brand new home designs, created specifically for the Shearwater lifestyle, feature an array of interior and exterior designer upgrades, granite countertops, stainless steel appliances, crown moulding, paver driveways and more. Homes range in size from approximately 1,868 to 2,663 square feet, feature three to five bedrooms, and two to three baths. Home prices start in the high $200,000s. Richmond American Homes offers inspired floorplans, incredible features and hundreds of personalization options to bring your vision of the perfect Shearwater home to life. Choose from a timeless collection of ranch and two-story homes, set on spacious 60-foot homesites. Homes range in size from approximately 2,250 to 3,150 square feet and offer three to five bedrooms and two-and-a-half to four baths. Home prices start in the low $300,000s. MasterCraft Builder Group, one of North Florida’s elite home builders, is offering beautifully designed semi-custom homes on 70-foot homesites in The Trails neighborhood of Shearwater. These new floorplans were thoughtfully designed for the modern way of living. Both one- and two-story plans back to a preserve and/or a large lake. Homes range in size from approximately 2,985 to 4,150 square feet, have four or five bedrooms, with three to four baths. Home prices start in the mid $400,000s. Visit our beautiful community to take a peek at these model homes yourself! Join our Founders Club to receive information about Shearwater’s home builders, upcoming events and more.